The President, Shri Pranab Mukherjee visiting the Auckland War Memorial Museum, at Auckland, in New Zealand on May 01, 2016. President Pranab Mukherjee on Sunday said friendship between India and New Zealand will continue to strengthen. "Friendship between two countries will continue to strengthen in the years to come to mutual benefit of our peoples," President Mukherjee said in a tweet on his visit to New Zealand. 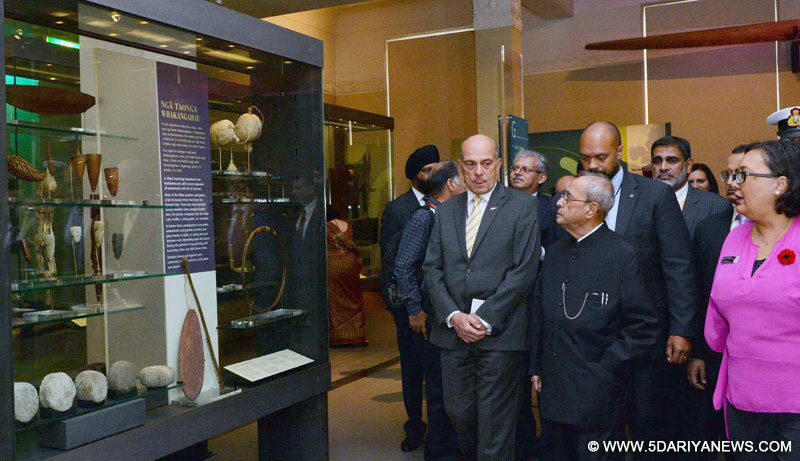 Mukherjee visited the War Memorial Museum at New Zealand's capital Auckland where he laid a wreath at the Hall of Memories of World War II heroes. The President also visited the Marshall Islands before his New Zealand sojourn. "India and Marshall Islands have traditionally enjoyed warm and cordial relations based on goodwill and mutual understanding," Mukherjee said in the tweet, extending greetings and felicitations to the government and people of the country on the occasion of their Constitution Day. He also met New Zealand Governor General Sir Jerry Mateparae at the Government House. The aim of the President’s visit to New Zealand is to have India as its core trade, economic, and political partner. New Zealand supports India’s aspirations for permanent membership of the UN Security Council.People-to-people ties between India and New Zealand have traditionally been close and the number of Indian students in New Zealand has grown exponentially over the last few year to about 23,000.